For years I’ve heard that the benefits of honey are huge and that white refined sugar should be avoided at all costs. Some people say they avoid this natural sweetener because it is higher in calories than white sugar. That is true but the calorie difference is so small yet the health benefits are so big making this natural sweetener a winner. So don’t hold back and enjoy every loving spoonful. After all, most of us love honey and it is used worldwide today and has been used through countless centuries in the past. This sparkling yellow thick liquid is enjoyed in hot beverages, baked goods, on cereal, toast and so much more. It is also used to improve many other products such as hair shampoo, body moisturizers, quality facial creams, lip balms and many other products such as house hold candles. So let’s take the time to list all the benefits of honey. This page was easy to share with you because I love this natural sweetener and use it daily in my morning lemon water as part of my healthy breakfast ritual and in my herbal teas that I enjoy daily even during the hottest of summer days. The calorie difference is small considering the benefits of honey. Yes it is true; honey has more calories than regular sugar. For instance 1 tablespoon of honey has about 60 calories and 1 tablespoon of white sugar has about 45 – 54 calories. But I like to think of these calories as extra energy that we get from a natural source. We do need energy to accomplish all of our tasks throughout the day, especially when we exercise. 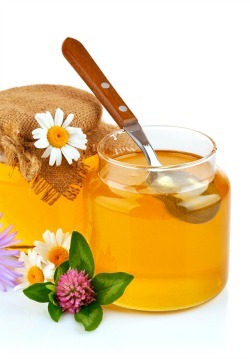 Honey comes in a variety of flavors and offers a plethora of different tastes. Make this natural sweetener a daily ritual whether you enjoy a spoonful on its own, with breakfast or in your beverages including smoothies, this is one super food that should not be overlooked. Another sweet treat is honeycomb. 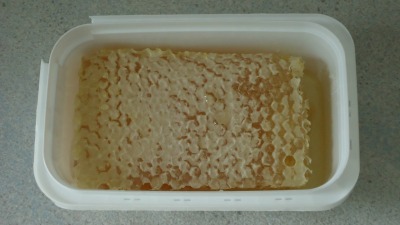 It is when the honey is left in the natural waxy comb that was made by the bees. Every now and then a spoonful of this stuff can be enjoyed especially when you need a little pick me up or just have a sweet tooth. I purchased a box of it the other day and here is a picture of what it looks like. It’s nice and sweet and once you pop a spoonful of the stuff in your mouth the honey just melts out of its waxy comb and then you can chew on the wax for a while just like it would be chewing gum. It really is a nice treat. The kids love it but they don’t have to know how good it is for them and all the benefits of honey, but it’s a great way to get the kids eating healthy, well at least in the sugar department.